There are many different types of providers at Western Wisconsin Health and each one is unique. Our providers offer a specialized practice depending on their education and training. 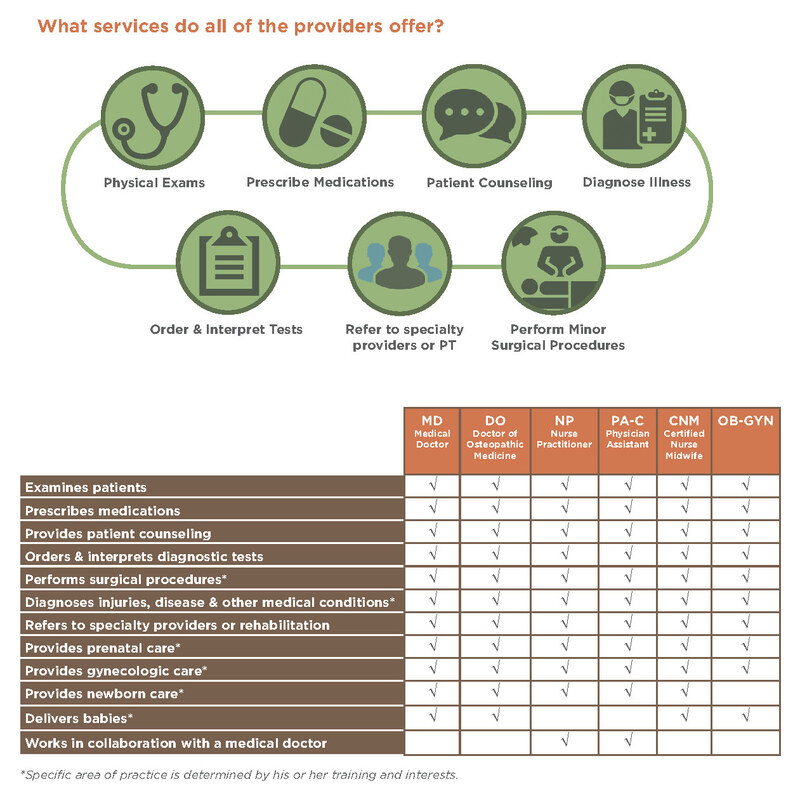 This information will help you decide which type of provider best suites your healthcare needs. Bachelor’s degree in Science studies followed by four years of Medical School. Formal education is followed by a residency from three to seven years depending on the specialty area of practice (example: a family practice doctor may have a residency of three years, while an orthopedic surgeon may have a residency / fellowship of 7 years). A Medical Doctor examines patients, prescribes medications, orders and interprets diagnostic tests, performs surgical procedures and diagnoses people for injuries, disease and other medical conditions. An MD may also provide prenatal care and deliver babies. An MD’s specific area of practice is determined by his or her training and interests. Bachelor’s degree in Science studies followed by four years of Medical School. Formal education is followed by a residency from three to seven years depending on the specialty area of practice. diagnostic tests, performs surgical procedures and diagnoses people for injuries, disease and other medical conditions. A DO may also provide prenatal care and deliver babies. A DO’s specific area of practice is determined by his or her training and interests. The education and training of a medical doctor (MD) versus a doctor of osteopathic medicine (DO) is very similar. The one difference is that a DO’s education places a strong emphasis on the musculoskeletal system in order to better understand how an injury or illness in one part of the body can affect other parts. Bachelor’s degree followed by an additional two years of training in an accredited Physician Assistant Program. A Physician Assistant examines patients, prescribes medications, orders and interprets diagnostic tests, and diagnoses people for injuries, disease and other medical conditions. A PA works under the supervision of a medical doctor. A PA’s practice may vary depending on the practice of the physician(s) he or she is working with and his or her interests. Bachelor’s degree in Nursing followed by a Master’s degree or Doctorate in Nursing. A Nurse Practitioner examines patients, prescribes medications, orders and interprets diagnostic tests, and diagnoses people for injuries, disease and other medical conditions. An NP may provide prenatal care. An NP works in collaboration with a physician or medical group. An NP’s specific area of practice is determined by his or her training and interests. Bachelor’s degree in Nursing followed by a Master’s degree or Doctorate in Midwifery Science. A Nurse Midwife provides preventative women’s health care, prenatal care, and labor and delivery care. They care for both women who want a natural birth and those that choose to have pain medications. They also provide care after the baby is born and help with breastfeeding. A CNM works in collaboration with an OB/GYN physician when necessary. Bachelor’s degree, followed by a Doctorate of Medicine degree. Formal education is followed by a four-year residency training program. An OB-GYN specializes in obstetrics and gynecology, focusing on women’s health, pregnancy, and delivery. They perform gynecological exams, deliver newborns, and perform a wide variety of surgical procedures. In addition, obstetrics and gynecology is one of the primary medical specialties to provide family planning services. Click here to learn more about our providers or call our 24-hour appointment line at 715-684-1111 to schedule an appointment.